The Thousand-Year Door Description Wear this to use Power Jump. 2 FP are required to use this attack, which lets you stomp on a foe with huge power. Wearing two or more of these badges requires more FP for the move, but increases the Attack power. Power Jump is a badge in Paper Mario and Paper Mario: The Thousand-Year Door. In Paper Mario, it is given by Goompa after returning him to Goomba Village, and is used as a tutorial on how to use badges (due to this, it is the only badge that Merluvlee never gives a prediction about). In Paper Mario: The Thousand-Year Door, it can be bought from the Lovely Howz of Badges for fifty coins, from the Pianta Parlor for thirty-four Pianta Tokens with the Special Card, and can be rarely dropped after battle by Goombas, Gloombas, Buzzy Beetles, and Spike Tops. 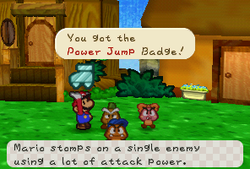 If Mario equips the badge, he is able to use the Power Jump move, which is a jump attack that costs two FP. The move is a single attack that, when its action command is timed correctly, deals double the damage of a regular jump to a single enemy. Gatsūn Janpu Powerful Jump. Gatsun is an onomatopoeia for a powerful hit and janpu is from English jump. This page was last edited on February 15, 2019, at 11:14.